The Federal Reserve has exploded its balance sheet. The United States government is borrowing and spending beyond its means. There is a chance that all of the Fed funny-money has created an unsustainable asset bubble in equity markets. As a citizen, there is very little you can do to change the performance of an out-of-control government. Nevertheless, you can take some simple, proactive steps to help defend your wealth and your family from the consequences of bad fiscal and monetary policy. In fact, that is pretty much the American Way in a nutshell. Today, we’ll explore one of those proactive steps in a little more detail: adding real, high-quality silver bars to your retirement portfolio. Unlike U.S. dollars or paper assets, such as stocks and mutual funds, silver bars cannot lose their value because of poor policy decisions. Silver is valuable, has always been valuable, and should remain valuable long after you need it. As popular as gold is — particularly in jewelry, art, and dentistry — silver has a wider application. Gold boasts superior resistance to corrosion and oxidation, but silver is superior to all other metals in terms of thermal and electrical conduction. It is also non-toxic and actively kills or inhibits microorganisms, such as bacteria. Because it is a much better industrial and medicinal metal, silver is used in a greater range of products and services than gold. In other words, silver may actually be a more attractive asset during extraordinary times (such as a currency crisis) because of its usefulness. Investors, especially those new to precious metals, may be attracted by silver’s lower entry price. (Read “How to Acquire Silver Without Hurting Your Wallet.”) More experienced gold investors can leverage silver as a way to diversify their precious metals exposure. The restrictions on eligible silver bars and coins are virtually identical. In order for a silver bullion piece (bar or coin) to qualify for an IRA, the silver must have a minimum metallic fineness of .999, which means it is 99.9% pure silver. 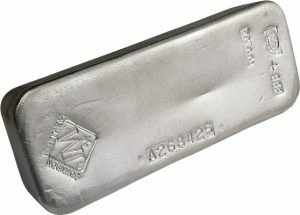 If the only thing you want your silver to do for you is help protect your wealth from potential economic or political threats, then you are probably best off using .999 fine silver bars. Silver can be added to most types of IRAs, including traditional IRAs and Roths. You must check with your custodian, however, because many are not designed to accommodate precious metals and may force you to cash out or transfer. A Silver IRA allows you to add precious metals (silver, gold, palladium, platinum). You must keep your physical investment assets (i.e. precious metals) in an IRS-approved depository. Thanks to extra regulation, adding silver bars to your IRA takes a little longer than adding stocks or bonds, which often only involve clicking a few buttons on your mouse. Obviously, the rules of prudent investing suggest that you should speak with a qualified tax accountant before making any major adjustments to your IRA (or other retirement assets). The IRS is not particularly forgiving to those who misstep while handling retirement accounts — ignorance is not a defense. Note that you cannot add silver (even IRA-approved silver coins and bars) that you already own, unless they are part of another IRA. In addition to the tips and strategies listed here, if you call now, American Bullion, which provides all the education you need, will discuss your options and handle all the steps for you, hassle-free! Our goal is to help give you control over your own retirement, and we work hard to ensure our services are transparent, safe, and efficient.